Former President Mohamed Nasheed visited Faaf Bilehdhoo yesterday (Saturday) to campaign for the Maldivian Democratic Party (MDP) candidate for a vacant seat in the Bilehdhoo island council, Ramzeena Afeef. According to the former ruling party’s website, Nasheed met MDP members and supporters in the island before returning to Male’ last night. MDP MPs Mohamed Gasam, Mohamed Shifaz and Ibrahim Rasheed are meanwhile campaigning in Meemu atoll for Ibrahim Latheef, MDP’s candidate for the Meemu Mulaku constituency atoll council seat. Former President Nasheed visited islands in the Meemu Mulaku constituency last Tuesday to support Latheef’s candidacy. In addition to the Mulaku and Bilehdhoo contests, by-elections are also due to take place on Monday, October 29, for a vacant island council seats each in Alif Dhaal Dhidhoo and Laamu Maibaidhoo. Meanwhile, newspaper Haveeru reported today that a delegation from the Progressive Party of Maldives (PPM) departed Male’ for Laamu Maibaidhoo and Meemu Mulaku to campaign for the party’s candidates Hassan Adil and Ali Ibrahim. The delegation includes PPM Parliamentary Group Leader and MP for Meemu Mulaku, Abdulla Yameen, and interim Deputy Leader Abdul Raheem Abdulla as well as other PPM MPs. The newly-formed Progressive Party of Maldives (PPM) held its first major political rally last night with a large number of supporters at artificial beach in Male’, vowing to “enter the presidential palace” in the 2013 presidential election. 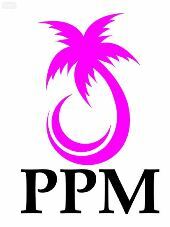 Following the completion of the registration process with the Elections Commission (EC) on Sunday and pending verification of over 10,000 membership forms, PPM becomes the third largest party in the Maldives with 13,000 members. As of October 30, 2011, the ruling Maldivian Democratic Party (MDP) has 47,904 members, followed by opposition Dhivehi Rayyithunge Party (DRP) with 35,260 and religious conservative Adhaalath Party with 6,140 members. Speaking at last night’s rally, PPM Registrar Dr Mohamed Saud said the party submitted 13,000 membership forms in 55 days, with the number expected to reach 30,000 by the end of the year. 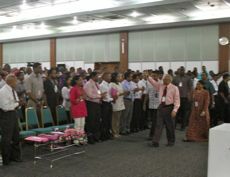 Dr Saud claimed PPM’s membership would reach over 60,000 in the next six months before its inaugural national congress. MP Abdulla Yameen, who has announced his intention to contest the party’s presidential primary, meanwhile said the executive was attempting to grab all powers of the state, accusing the current administration of being incapable of governing under a lawful and democratic system without street activism and “intimidation” of state institutions such as the judiciary. Yameen also claimed senior leaders of the MDP government were “drenched in the blood of the martyrs” of the November 3, 1988 coup attempt with mercenaries from Sri Lanka. MP Abdulla Yameen Abdul Gayoom was grilled by parliament’s National Security Committee today over allegations of an illegal oil trade worth US$800 million with Burma while the Mulaku MP was chairman of the State Trading Organisation (STO). In the face of repeated questioning during today’s meeting, Yameen denied any involvement in “micro-management” of STO subsidiary companies during his time as chairman until 2005. A resolution proposed by Maldivian Democratic Party (MDP) MP Mohamed Musthafa to investigate the allegations was sent to the National Security Committee on August 2, which has since summoned and questioned senior STO officials. The allegations first appeared in February this year in India’s The Week magazine in a cover story by Sumon K. Chakrabarti, Chief National Correspondent of CNN-IBN, who described Yameen as “the kingpin” of a scheme to buy subsidised oil through STO’s branch in Singapore and sell it through a joint venture called ‘Mocom Trading’ to the Burmese military junta, at a black market premium price. “The Maldives receives subsidised oil from OPEC nations, thanks to its 100 percent Sunni Muslim population. The Gayooms bought oil, saying it was for the Maldives, and sold it to Myanmar on the international black market. As Myanmar is facing international sanctions, the junta secretly sold the Burmese and ‘Maldivian’ oil to certain Asian countries, including a wannabe superpower,” alleged Chakrabarti. “Sources in the Singapore Police said their investigation has confirmed ‘shipping fraud through the diversion of chartered vessels where oil cargo intended for the Maldives was sold on the black market creating a super profit for many years’,” the report added. The article drew heavily on an investigation report by international accountancy firm Grant Thornton, commissioned by the government in March 2010, which obtained three hard drives containing financial information of transactions from 2002 to 2008. No digital data was available before 2002, and the paper trail “was hazy”. In 2004, investigators from accountancy firm KPMG found in an STO audit that Mocom Trading was set up in February that year as a joint venture between STO Singapore and a Malaysian company called ‘Mocom Corporation Sdn Bhd’, with the purpose of selling oil to Myanmar and an authorised capital of US$1 million. According to The Week, the company had four shareholders: Kamal Bin Rashid, a Burmese national, two Maldivians: Fathimath Ashan and Sana Mansoor (employees of STO), and a Malaysian named Raja Abdul Rashid Bin Raja Badiozaman, who was the Chief of Intelligence for the Malaysian armed forces for seven years. As well as the four shareholders, former Managing Director of STO Singapore, Ahmed Muneez, served as the director. Malaysia’s Mocom Corporation was one of four companies with a tender to sell oil to the Burmese junta, alongside Daewoo, Petrocom Energy and Hyundai. Muneez, Ashan and Sana have been questioned by the National Security Committee over the past two weeks. The STO chairman under the previous government was not an executive chairman who handled day-to-day management of the state-owned enterprise, Yameen explained, adding that appointing board members to subsidiaries was handled by the Managing Director. He added that “micro-management issues” of subsidiary companies were not dealt with by the STO board and the chairman “did not know and did not have to know”. Asked by MDP MP Mohamed Thoriq if he believed Mocom Trading was formed illegally, Yameen said he did not know “even the date the company was formed” or Mocom’s board members. Former STO Managing Director Manik had previously told the committee that he discovered Mocom’s existence when the issue came up at an annual general meeting. Asked by Dhivehi Rayyithunge Party (DRP) MP Mohamed Nashiz if he visited Singapore on official trips on behalf of STO, Yameen said he never went to Singapore with the express purpose of evaluating STO Singapore. Nashiz suggested that Muneez’s claim that he “made all the decisions on his own” was dubious. DRP MP Rozaina Adam meanwhile noted today that testimony by STO MD Manik and STO Singapore MD Muneez “conflicted” as Manik insisted he was unaware of Mocom’s formation but Muneez said it was formed after the head office provided all the required legal documentation. Manik had also revealed at the committee that Muneez’s annual bonus was withheld as a result of his role in forming the joint venture without a board resolution. Asked by Rozaina if the MD had shared any concerns with the chairman, Yameen said he had not. Yameen however said he found it “very hard to believe” that the MD or accounting section would have been unaware of the transactions with Mocom. Today’s meeting was disrupted at frequent intervals by shouting matches that broke out between MDP and the former president’s newly-formed Progressive Party of Maldives (PPM). MP Yameen, half-brother of Gayoom and long-serving Trade Minister in his cabinet, was elected by the PPM interim council as its parliamentary group leader. Parliament yesterday rejected at the preliminary stage a bill proposed by the government to modernise the existing Companies Act as part of its 18-bill economic reform package. The bill was narrowly rejected 37-36 in a vote to send the draft legislation to committee for further review. Jumhooree Party (JP) Leader Gasim Ibrahim – who voted with the ruling Maldivian Democratic Party (MDP) in August to pass the Goods and Services Tax (GST) legislation, the first of the 18 economic reform bills to be passed – cast the swing vote against the proposed company law. According to the government, the purpose of the bill was to modernise bureaucratic procedures for formation and registration of companies and facilitate ease of doing business. Among the main changes proposed to the existing law were enabling formation of companies with a single shareholder or a single director (the law currently requires at least two); abolishing the annual companies fee; specifying procedures for seeking authorisation from government agencies along with registration procedures for foreign investment companies; enabling the registration of branches of foreign or multi-national companies in the Maldives; outlining criteria for company directors and managing directors; specifying procedures for public disclosure; streamlining the process for dissolving registered companies; and delegating the tasks of the companies registrar to local councils. During the preliminary debate stage, opposition MPs however contended that as a Companies Act was enacted in 1996, the government could not propose a bill under the same name. MP Abdulla Yameen, who served as Trade Minister and chairman of the State Trading Organisation (STO) under the previous government, objected to a provision stipulating that the minimum capital required to register a company would be Rf2,000. With the country’s level of development and an annual budget in excess of Rf12 billion, said Yameen, the figure was too low especially if directors’ and shareholders’ liability would be limited. Moreover, Yameen added, the proposed law would give legal discretion to the registrar of companies or an official appointed by the President to deny requests for company registration if it is believed to pose a threat to national security. Granting such discretion to a single state official, including the power to dissolve companies if it is believed to be in the public interest, was “how things are done in uncivilised countries,” he said. “Because we are unfamiliar with this concept what happens is that people are reluctant to invest their money in a business,” she explained, adding that the law would ensure that shareholders would be liable to the company’s debt only to the extent of their shareholding. Mausoom noted that there was an existing law that governed company formation and registration. The DRP also objected to the government’s proposed amendments to the Immigration Act to grant resident visas to skilled expatriates as well as a bill to abolish existing foreign investment laws, Mausoom said. “We voted against [the proposed company law] because we didn’t see anything positive in the bill,” he said. As parliament had rejected the bill at the preliminary stage, said Razi, the government could not submit the bill again during the ongoing session. “But we will consult with the legal people and stakeholders to propose the bill as amendments to the existing Company Act for the next session,” he said. While it would have been “ideal” to pass all the component bills of the reform package on schedule, Razi continued, yesterday’s vote did not constitute a serious setback to the reform programme. “It will have an impact, yes, but it will not be a very negative impact,” he said. A resolution proposed by MP Mohamed Musthafa calling for an official investigation into an alleged US$800 million worth of illegal oil trade involving former President Maumoon Abdul Gayoom and MP Abdulla Yameen was sent to committee today. The resolution was approved 52-11 and sent to the national security committee for further review. MP Yameen, who was chairman of the State Trading Organisation (STO) and long-serving Trade Minister under the previous government, however contended that the sale of oil to Burma was not illegal. As the Maldives was a member of IMO, said Musthafa, trading by sea with Burma would have been a violation of the organisation’s laws. Musthafa alleged that there was “serious shipping fraud” involved in the trade. Musthafa challenged Yameen to present 12 kinds of documents to the government to prove his innocence, including shipping documents, bank documents such as LCs (line of credit), board of resolution for forming MOCOM, documents of business transactions, tax receipts to the Singaporean government, purchase and sale contracts, bills of exchange submitted to the banks, account statements and logbooks, cargo manifests and bills of lading of the ships. Musthafa suggested contacting the United Overseas Bank and Standard Chartered Bank to obtain the documents and seeking Interpol assistance for the investigation. The Presidential Commission did not have the capacity to investigate fraud on such a scale, he said. The commission was being assisted by forensic accountancy firm Grant Thornton, British law firm Lawrence Graham LLP, a Singaporean law firm and several other international organisations, he said. Minority opposition People’s Alliance (PA) Leader MP Abdulla Yameen called on the government today to investigate allegations of US$800 million worth of blackmarket oil trade by the State Trading Organisation (STO) while he was chairman of the state-owned enterprise. Yameen added that STO senior officials alleged to be involved in the oil trade were still employed by the government: “They are now in high posts in the MDP,” he said. “So if you dare to investigate this, by all means go ahead,” he continued. “I encourage that this be investigated. The other thing I want to say is that I have now become impatient. Even if they stack US$800 million worth of documents on one end of the scale, there is no way they would be able to prove [any wrongdoing]. “The documents are with the government. We did not take documents home with us when we left office,” he said. Yameen, brother of former President Maumoon Abdul Gayoom and long-serving Trade Minister in his cabinet, claimed that the administration possessed a list of senior officials of the previous government who had purchased assets overseas. The MP for Mulaku claimed that the government has paid “over a million dollars” to forensic accounting firm Grant Thornton, without uncovering any evidence to implicate Yameen. Yameen said that he was “ready to sue” for defamation if a final report “under seal and signature of Grant Thornton” was made public. The right of individuals to be considered innocent until proven guilty was “a sacred provision” in the Maldivian constitution, he said. “I don’t believe this case should be debated in parliament,” said Gasim, arguing that the constitution protected the rights of the accused. MP Eva Abdulla of the ruling Maldivian Democratic Party (MDP) meanwhile observed that the audit report of the State Trading Organisation (STO) had noted that about Rf11 million (US$80,000) in local currency was released to Emerald Resort Pvt Ltd as loan facilities between April 1, 2003 to April 3, 2005 to be paid back in US dollars. “The same report noted that STO imported medical equipment without a bidding process at a much higher price than [the equipment] was available for,” she continued. Eva also referred to the audit reports of the Maldives Customs Service, which revealed that luxury yachting company Sultans of the Seas in 2007 had forged documents to evade import duties for a yacht. The MDP MP for Galolhu North revealed that the Presidential Commission was currently investigating over 25 similar cases of corruption and misappropriation of state funds by the former government. The state has requested an extension in the civil suit brought by MP Abdulla Yameen against the Maldives Police Service for unlawful arrest, claiming that it is awaiting a report from the Supreme Court of its verdict on a related case, reports Haveeru. The Supreme Court ruled on June 29 that Yameen’s arrest on charges of alleged bribery and attempting to overthrow the government was unlawful. At the second hearing of the case on Sunday, Yameen’s lawyer Azima Shukoor, a former Attorney General, argued that the absence of the Supreme Court report was not justifiable grounds for failing to answer to a civil suit. Judge Aisha Shujune adjourned the hearing after scheduling the case for November 29 and told the state attorney that it would be the final opportunity to respond. While the lawsuit did not specify an amount for compensation or damages, Azima argued at the last hearing that the arrest was in violation of articles 47(b), 45, 46 and 48(a) and that the claimant had to spend Rf61,005 on strengthening security at his residence and Rf668,950 on lawyer’s fees. In addition, the claimant also claimed to have suffered emotional and psychological distress during the arrest, which took place while an angry crowd was protesting outside his house. People’s Alliance (PA) leader Abdulla Yameen has told local media outlets that he is being held against his will by the Maldives National Defence Force. The MNDF has claimed Yameen sought their protection after violent clashes between MDP supporters, police and another group outside his house on the evening of July 14. The leader of the minor opposition party, who was last week released from house arrest by the Supreme Court, had been accused by the government of corruption, bribery and treason. The MNDF have refused to present Yameen in court, despite an order from the Criminal Court on July 15. The government has meanwhile said it intends to monitor the judiciary to ensure corruption does not obstruct the judicial process. Speaking to private broadcaster DhiTV from the Presidential Retreat ‘Aarah’ last night, Yameen said he was contacted repeatedly by Chief of Defence Force Moosa Ali Jaleel and told that the army had orders to take him under protection by force if necessary. Providing his account of the incident, Yameen stressed that he refused the offer of protection and requested that security forces control the crowd outside his residence. He added that Moosa Jaleel informed him between 12:00am and 1:00am on Wednesday night that MNDF had “no choice” but to take him under military guard. Yameen said he was at PA MP Ahmed Nazim’s house at the time when crowds began gathering outside his residence. Yameen, former Trade Minister and younger brother of former President Maumoon Abdul Gayoom, strongly criticised the government’s handling of the political unrest in the capital. Yameen called on the security forces not to be “too concerned with one individual” and ensure the safety of the public. Yameen and Nazim along with MP Gasim Ibrahim is currently under investigation for alleged corruption involving “cash for votes” in parliament. A press release issued by the President’s Office on Thursday states that the unrest was precipitated by an attack on the ruling Maldivian Democratic Party (MDP) rally on Wednesday night. It adds that a group of people tried to incite violence and attacked participants at the rally. In his weekly radio address on Friday, President Mohamed Nasheed said the government was “forced” to isolate political leaders after considering the consequences of inaction. The Maldives was experiencing “teething pains” with the present political crisis, Nasheed continued, as multi-party democracy was in still in its infancy. Despite Nasheed’s apparent confidence in resolving the country’s political deadlocks lawfully and peacefully, the outbreak of violence has drawn the attention of international bodies such as the UN. “Political rivalries should not be allowed to jeapardise the significat gains the country has registered in democratic reform,” Ki-moon said, pledging the assistance of the UN in resolving the situation. The UN “recogises the positive steps taken by the Maldives to advance democracy in recent years, and underlines the importance of cooperation and accomodation among the various political actors as an essential ingredient of building democracy,” the statement read. The United States has meanwhile urged the Maldives to accept offers of mediation from the international community to resolve the political crisis. “We call on all sides to refrain from violence and to come together to resolve disagreements through dialogue,” the US Embassy in Colombo said.